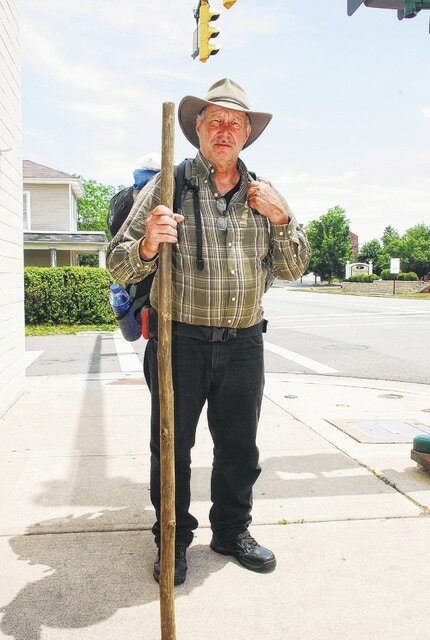 A Virginia man in the midst of a yearlong hike to North Dakota and back was treated to some Champaign County hospitality as he passed through the area June 9-10. Young said he arrived in Mechanicsburg on June 9 and was greeted by Mayor Greg Kimball and Village Administrator April Huggins-Davis. After spending the evening in his tent behind the Mechanicsburg Municipal Building, Young said he received a ride to the Urbana Municipal Building the next morning, where he introduced himself to city officials. After spending June 10 at Caring Kitchen, Young planned to head west on U.S. Route 36 toward Greenville on June 11. Once in Greenville, he will head north on U.S. Route 127 to Van Wert, where he will then head west on U.S. Route 224 on his way to Indiana.